On any given night at Solvang’s Root 246, diners are eating in the kitchen. A four-person table is set in front of the restaurant chefs, who work through the evening with the immediacy of a well-oiled machine. Consulting chef Bradley Ogden’s conceptual mold is shaped around local and organic ingredients and the culinary artistry of textures and colors. He gets people conscious of ingredients, even when it comes in the form of the bar menu’s foot-long, wood-grilled “Chicago Style” hot dog with organic tomato and house-made pickles. Root 246’s April 2009 opening at Hotel Corque in the heart of Santa Barbara wine country came with the celebrity cachet of Ogden, whose critical acclaim has soared to untouchable levels thanks to eight California and Las Vegas restaurants under the Lark Creek Restaurant Group. The menu showcases his take on classic “farm fresh” American cuisine, which uses only domestic ingredients available from fishermen, farmers, and ranchers across California. 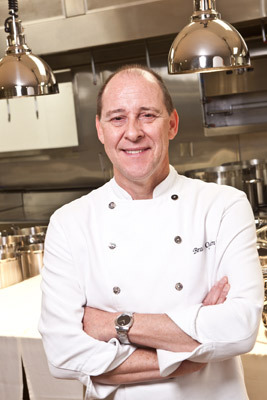 Born in Traverse City, Michigan, Ogden began his formal training at New York’s Culinary Institute of America. He rose to national prominence in San Francisco as executive chef at the renowned Campton Place Hotel, from which he embarked on opening his own restaurants in 1989 by forming the Lark Creek Restaurant Group. Ogden took on the spot owned by the Santa Ynez Band of Chumash Indians in Solvang two years ago to tap into the tremendous potential of Santa Barbara County, which he likens to Napa Valley in the early ’80s. This potential includes the abundance of high-quality artisan farmers, vintners, meat, and just-off-the-boat fish suppliers, along with other subsidiaries such as olives, vinegars, dairy products, and honeycomb. The menu selection changes daily depending on what comes into the kitchen that morning. Eager to demonstrate his culinary philosophy, Ogden tours the expansive kitchen with a hop in his step, introducing each member of the staff like family. Pride and excitement lead him from the prep kitchen, which houses an oak grill and meat smoker, to the intoxicatingly aromatic pastry corner, to the cheese room, all the way back to the chilled room dedicated to vibrant colors of produce picked that morning. Boutique farmers fill this space with a seasonal rainbow of organic veggies. Trays holding summer peaches, figs, and strawberries lay on wheeled shelving near the kitchen’s back door, only chopped when needed for an order. Everything is done in-house from scratch, including Pacojet spun ice cream and a single fresh-fruit-of-the-day sorbet. 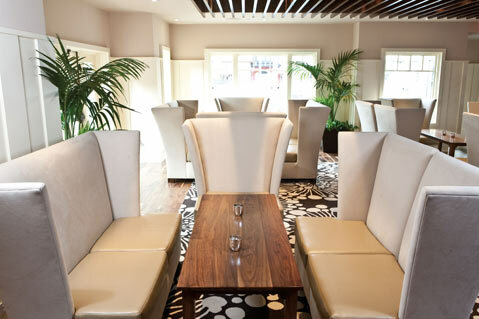 Just as American cuisine incorporates a plethora of cultural influences, the restaurant’s decor presents a striking assembly of California, Hawaiian, and Southern elements. Although each of the four dining areas is decorated differently, the common thread incorporates comfort, contemporary shapes, and light-filtering shuttered windows. Neutral tones with popping graphics come in the form of abstract floral floor rugs, weaved-iron table lanterns, undulating rectangular wall details, tiny iridescent tiles, and touches of velour. 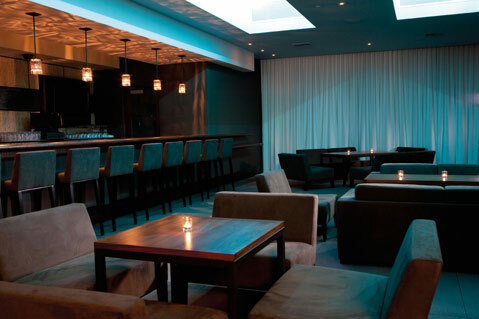 Proportions are played with through co-mingling geometrics, tall leather booths, and surprisingly large ceiling lamps, which give off the warmest and softest light imaginable. Diners have a choice to sit in one of the two interior dining rooms, the private dining table for small groups, the chef’s table in the kitchen, a chic, dimly lit bar area, or a covered outdoor lounge. No matter where you sit, the menu offers an eclectic selection of intriguing yet comforting options that include Early Girl tomatoes, Marshall Farms honeycomb, oak-fired Oregon albacore, and heirloom melon. Playing with these ingredients, Ogden and executive chef Johnny Church create such memorable items as watermelon carpaccio, tomato ice water, frothed foie gras cappuccino, and corn spoonbread chimichurri. 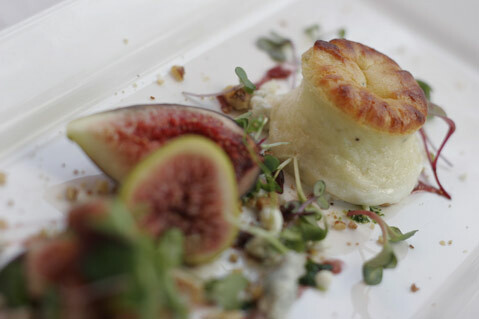 Although Ogden hesitates to name his favorite dish on the menu, with some careful thought he arrives at the sweet and powerfully rich Maytag blue cheese souffle, plated with Coachella Valley figs and spiced walnuts. Lighter options include a plentifully portioned halibut ceviche or the heirloom tomato salad, but if ever there was a reason to splurge on decadence, this is the place. Sous-vide Hobbs pork belly with peach crpe, bacon vinaigrette, and peach gremolata combines sweet and savory as well as crispy and juicy. To say the oak-grilled prime rib-eye steak is like butter is not a worthy enough description for this tantalizingly tender cut of beef masterfully buttered and sizzle-charred. A bar menu has about 11 small plates to enjoy with drinks, while the cheese menu lists different combinations of aged, coated, and creamed cheeses and accompaniments. The wine list is 99-percent local and stored in a glass room near the entrance of the restaurant. Weekend brunches are served with standards set as equally high as dinner, but Ogden prefers to start off at a walk, not a run, taking his time to perfect dinner service before opening daily for lunch. That run may pick up sooner than he may imagine. 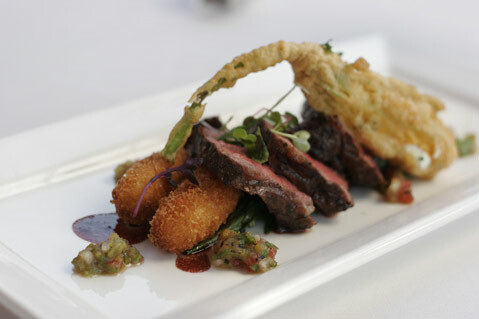 Taste American cuisine that reigns supreme at Root 246, 420 Alisal Road, Solvang. Call 686-8681 or visit root-246.com.